Yesterday was Women’s Equal Pay Day, the day that women’s wages catch up to what their white, male counterparts earned last year. Yes, that’s correct. It’s now April 2019, and it’s taken 15 months for women to earn what a white man earned by December of last year doing the same exact job. That’s because women earn just 85 cents for every dollar earned by white men with the same level of education and experience. And it’s even worse for women of color. 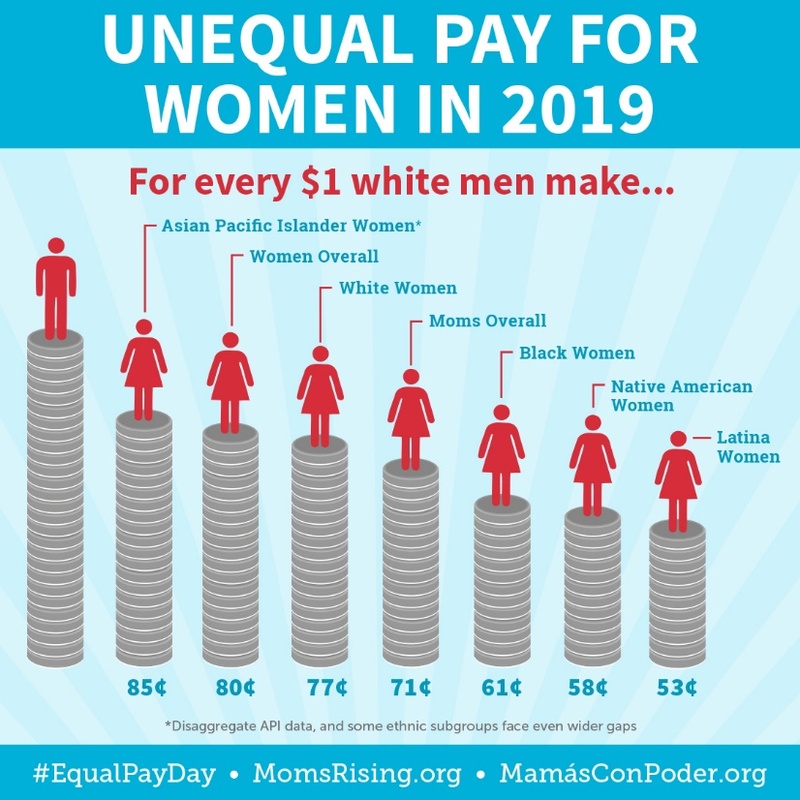 Black women earn 61 cents for every dollar earned by a white man, Native American women earn 58 cents on the dollar, Latinx women earn just 53 cents on the dollar, and Native Hawaiian and Pacific Islander women it earn just 62 cents on the dollar. Looking at a year’s paycheck, it takes Black women almost 20 months, Native American women 21 months, and Latina women 23 months to earn what white men earn in just 12. And at the rate we’re going, it will take until another 40 years for all women to catch up to men’s paychecks. Shockingly, Latina women won’t achieve equal pay until 2248! The women’s pay gap is not just unfair, it’s also hurting our economy. Despite making up less than half of North Carolina’s workforce, women are over-represented in minimum wage and low-wage work. Women in North Carolina are 47.8 percent of the workforce, but 67.9% of those making $11.50 or less per hour. In fact, women in North Carolina are more than twice as likely to work in a low-wage job compared to a man. When women earn more money, they have more to spend on themselves and their families—and that means more customers and more sales for businesses. A recent McKinsey Global Institute study found that eliminating this pay gap would boost the economy by as much as $28 trillion by 2025. And unlike trying to grow the economy cutting taxes for millionaires (which only helps the millionaires), pay equity grows the economy in a way that broadly shares the benefits of that growth, especially among the low- and middle-income women who would experience the biggest raises. Although North Carolina can address pay equity through policies like tightening anti-discrimination laws and improving childcare subsidies, perhaps the biggest step the state can take involves raising the minimum wage. More than 830,000 women would see an average raise of about $4,411 every year from seeing the minimum wage rise to $15 an hour. Achieving pay equity is critical—no one should have to wait 40 years to earn the same as a man for the same day’s work.